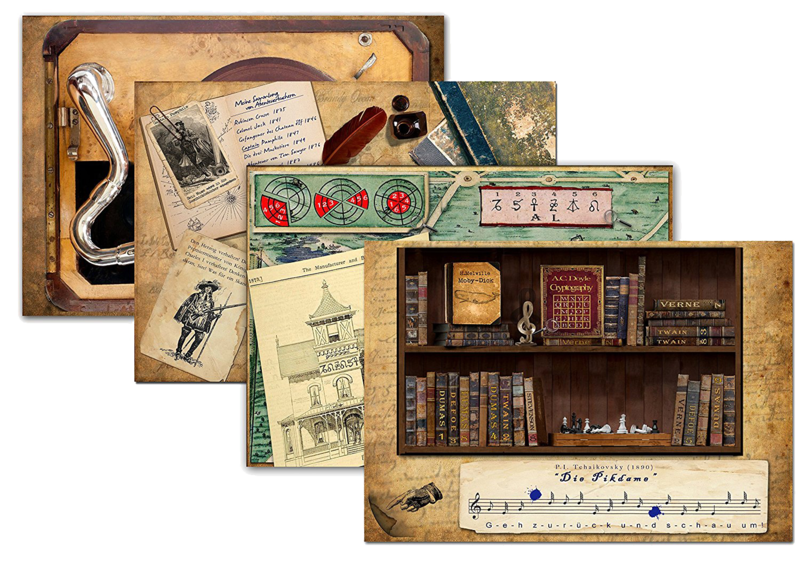 It seems like another escape room in a box comes out every two or three weeks at the moment so, if a game is going to be successful, it has to do something special to set itself apart from the crowd. The Unfinished Case of Sherlock Holmes is the latest one to appear in our house and, housed in a slightly bigger than A4 envelope, at first sight it didn’t look like it had much of a chance on that front. The reason for that thin-form factor is that iDventure have chosen to make their games both printable at home and purchasable via Amazon, thus providing options both to the frugal gamer and to those aiming for the fuller experience. Naturally, that “full” experience was never going to be anything like an escape room experience, but I was intrigued to see what they could produce with what seemed, in essence, to be a folder of A4 sheets of thin card. First impressions were good, with great quality printing and a thought-through story (albeit with some minor typos), but things went downhill a little when we had to go through some initial tedium before we could jump into the game. All the other escape rooms I’ve played have allowed me to get on with the fun part immediately, but here I had to go to a website, register an account, register my copy of the game, download an app and then finally kick things off. It probably only took a little over five minutes, but I didn’t know that I’d need to go through those steps until we’d sat down to play, so the team had to wait around while I set things up. Not the most auspicious of starts. With that out of the way, it was time to begin the game proper. After stumbling through some opening audio which seemed to be generated by a computer rather than recorded, we got to see the general layout for the game. At each stage, we’d be presented with a little bit of text to explain where we were in the story, followed by a question which we’d have to answer before we could proceed. They eased us in with a gentle starter question to confirm we knew how the game should work from both a puzzle and an app point of view. That was good because later in the game, when things weren’t so clear, it made me realise how I might have assumed I just didn’t understand what I was meant to do to play the game. It did annoy me slightly that I needed a phone to play the game – I found it a less satisfying mechanism than the code wheels and cards favoured by other boxed games. That wasn’t helped by the fact that I often wasn’t entirely clear what I needed to type in. They used bold text to both represent what you were being asked for and the important pieces of information, with the result that there was a point where we knew the answer but were typing in too much information. The “props” themselves were pretty. Granted, they were produced on relatively cheap card stock, but they were big, glossy and professionally printed. It was nice to feel like you didn’t have to pull the sheets close to your eyes to see the detail, and print quality was never an issue with understanding the images. There were four or five sets of props to make use of, at least two of which gave an impression of a more physical puzzle than you might expect in this kind of package. When it comes down to it, though, I think escape rooms in a box live and die on the puzzles. They can’t fully immerse you in the same way a real game can and they can’t create a beautiful set, but they can create good puzzles and get them to flow naturally. Here, they’d chosen to present the players with a wealth of information at the beginning and, while it wasn’t always clear when you’d need each piece, we also never found ourselves having to dig diligently through the pages to find the clues. It worked well – giving us the feeling of searching but at the same time giving us a reasonable amount of direction. By and large they were solid puzzles that weren’t immediately obvious but weren’t obtuse either. When we found the answers out we invariably felt that they made sense. That said, there were still some problems with the game. As discussed earlier, it wasn’t always easy to work out exactly what the designers had been looking for from the questions, but it also wasn’t always obvious when you’d come to the end of the puzzle – on at least two occasions we input information that turned out to be just a stepping stone to the final puzzle rather than the final answer itself. Our frustration at that was exacerbated when we asked for hints and would invariably be penalised (such was the mechanism) for being told what we already knew. Given that you’re really only playing this for your own amusement and could easily cheat if you so desired, I think they should have an option to say “I already knew that” when you get a clue. Even in the finale, we ended up in that situation. It turned out we’d solved the puzzle and had all the relevant information but the language was a bit loose in the final request, which left us thinking there would be more to the game. I enjoyed the content of this game, the feeling that it was packed full of fun information, and a story that moved along at just the right pace for an escape room, but ultimately I felt a bit let down by some of the puzzles and the answer verification mechanism. Too often, it wasn’t 100% clear to me what we needed to input, a legitimate answer to a puzzle wasn’t the one they were looking for or the clues they offered were things we’d already worked out. For me, those minor issues took the edge off the experience. I have hopes that they’ll fix them, though – warn players that they’ll need five minutes to set up (and that they can do this well before the game), re-record the introductory audio, remove the penalties for making mistakes and clarify what’s being looked for at each stage (either through the app or with the printed sheets). If they do that, then I think this would be one of my favourite play-at-home games. You can see another opinion of this game over at Escape the Review. Full disclosure: We weren’t charged for this game. That doesn’t influence the review – you can read more on the About page.